Small Farmers Greening the Planet: Piura Mountains Reforestation Project wins the ProClimate Challenge | Small Farmers. Big Change. Two Peruvian projects, one from Piura and the other from Tingo Maria, winners of the ProClimate Challenge in the best practices regarding climate adaptation and mitigation, received their awards this morning in the city of Piura, having competed with 43 proposals from 12 countries around the world. Held at the College of Engineers, the Piura Mountains Reforestation Project received the award. This project is executed by CEPICAFE, the Norandino Coop and Progreso and is located in the town of Choco, Yamango district, Morropon province. It won the award in the coffee category since it is carried out in a coffee-producing zone and requires high-quality water and the best possible climatic conditions. 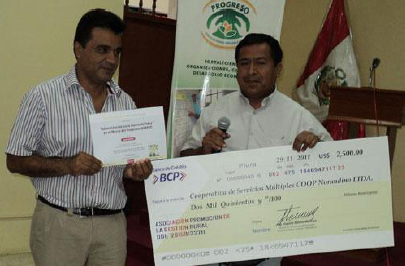 Santiago Paz Lopez, manager of the Norandino Cooperative that is part of the Central Piruana de Cafetaleros, CEPICAFE (Piura Coffee Growers Association) received the $2,500 prize. “When our producer organization was started we had no resources, but we have achieved a lot. Now we have won this prize, which belongs to the producers. They needed a lot of support in order to start this kind of project. The Norandino Cooperative is part of the producers that make up CEPICAFE and, together with other organizations from northern Peru, we are promoting the export of products such as cacao, coffee, raw sugar and fruit, all of which are quality products with an important consumer demand around the world,” said Santiago Paz. The project encompasses 264 hectares, 224 of which need to be reforested. This project will be executed through the year 2035 and its goal is to produce 42,784 tons of carbon. “In this area up to 600 hectares could be reforested, but we are also looking at the possibility of expanding to other mountainous areas and as much as 10,000 hectares could be reforested,” he said. Rocio Leon, Project Coordinator, said that the Challenge has shown appreciation for projects in the highlands that are combining reforestation with carbon capture because this is something that generates better production for the farmers in the highlands and improves water availability in the coffee-growing zone. The project is being developed at an altitude of 2,700 to 3,000 meters above sea level on community-owned land in the hamlets of Choco, Alto Huancabamba, Huambiche and Sargento Lorez and currently benefits 325 families. The Progreso Network and ProClimate and Hivos from Holland organized the ProClimate Challenge in the best practices regarding climate adaptation and mitigation. The Piura Mountains Reforestation Project is certified by Rainforest Alliance and by the Carbon Fix Standard v3.0; it is also registered with Markit Environmental. The local community members that execute the project are also project participants and full owners of their own farms. The Piura Mountains Reforestation Project is the first organization in the world in which an organization of small producers has been able to sell carbon credits in the voluntary market. It is currently selling carbon to companies in England and Ireland that are part of CEPICAFE’s client network. In addition to the Norandino Coop, CEPICAFE and Progreso, other organizations that participate in the project include Agronomos Sin Fronteras (Agronomists Without Borders), Veterinarians Without Borders, Forest Sense and Just Green.